August was somewhat warm but windy on certain days. This week's weather was bizarre! One day was warm and sunny, and the next, was cold and very windy. It was so windy that my backyard pot plants were knocked over. It doesn't help the forecasted weather sometimes is a complete miss. Case in point: last month, every news station forecasted rain and possibly a thunderstorm by mid-week for the coming week. I got the umbrellas ready for my kids. On Monday morning, at 6:00AM, when I opened my living room window, there was no wind at all. It was somewhat warm. I thought the rain might come later in the day so I had my kids warmly dressed and put an umbrella in each of their backpacks. The weather was just absolutely gorgeous that day. My kids weren't happy coming home that afternoon because they were ridiculously overdressed. The next day, Tuesday, was another gorgeous day. It was actually beautiful and sunny the entire week. All my family and friends were asking the same question, "Whatever happened to our thunderstorm?". There's been a lot of talk about a very cold winter for San Francisco this year. It was very cold last year, I don't remember the weather being that cold before. It was cold to the point where I had to buy Uggs because my feet got so numbed walking outside. Well, this year, everyone's saying it's going to be very cold. With the way the weather is going now, I wouldn't be surprised if it'd be warm in the winter. That would be lovely though...a warm winter. I'm from SF and yeah, the weather has been really crazy, hot one day and very cold the next day. It's been windy lately too, everything gets blown away. You're right about the weather forecast, sometimes it is completely wrong. Every day is unexpected. It seems like we have moody weather and it's no wonder people are getting sick. I was at supermarket yesterday and there were people coughing and sneezing. I hope this weather pattern doesn't go on like this for a long time. 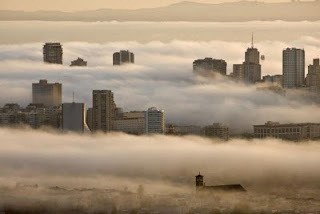 I'm over in Livermore, where our weather is much warmer, but I like the San Francisco fog. Of course I'm originally from the NorthEast where we wear shorts as soon as the weather gets up to 50 degrees. Since we're used to subzero weather in the winter my kids are always under dressed compared to the other kids. I guess eventually we'll adjust. Is it windy in Livermore? My friend from Antioch says it's a constant 85 degrees and she hates it.